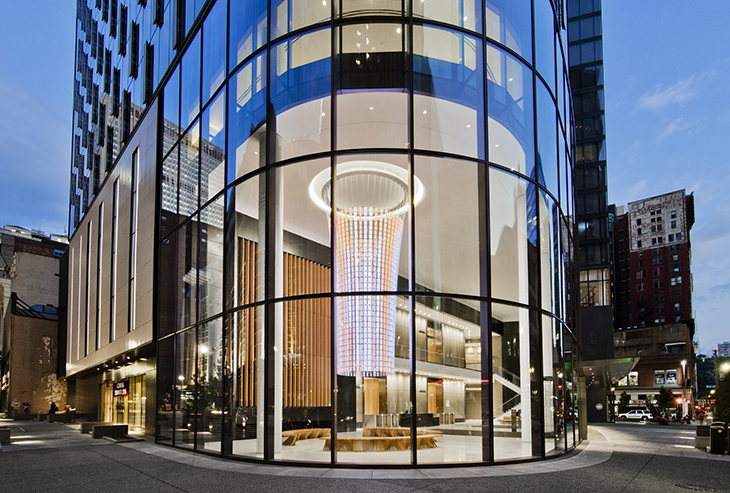 The Beacon at The Tower at PNC Plaza visualizes how the building maximizes its use of natural resources. Image © Chris Leonard. Last year was a rough year for climate action advocates, particularly in the United States. We witnessed one of the three warmest years recorded; historic lows in Arctic sea ice; devastating hurricanes and flooding in Texas, the Caribbean, and Florida; and record-breaking wild fires throughout California. A report released in June by scientists from 13 federal agencies concluded that barring drastic action to reduce carbon emissions, we would likely see a 5 degree Celsius or more increase in temperature by end of the century, which would result in crop yields plunging, electricity consumption spikes, and untold damage to coastal cities. This post is part of a series in which we look at the critical role that the architecture and design play in global efforts to address climate change. For more on the research behind it, take a look at our Impact by Design report.